The much-anticipated follow-up to the successful Serie R Esteli, this new expression combines deep sweetness with leather notes and spice. A rich maduro which will satisfy the most discerning palates. A Maduro cigar is a favorite thing of mine to enjoy. This is not to say that other cigars are not good, or that they cannot be delicious, but when I’m looking to enjoy a cigar, I tend to find that the cigars I want are all of the darker and oilier variety. Indeed, many of the best cigars that I have ever enjoyed are Maduro cigars, and now they’re the majority of what I like to smoke. 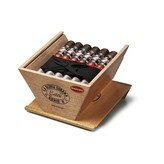 But I also understand and accept a reality of smoking Maduro cigars; they are usually hard to find. They are not as popular with the general cigar smoking populace as the more light-bodied cigars, and because of this, there are plenty of times when you walk into a small cigar shop’s humidor and can’t find the cigar that you would like, or one that will fit your tastes. Indeed, I have found that I often have to resort to shopping via an online cigar shop to find the things that I want to smoke. Luckily, this offering from La Gloria Cubana is much easier to find. If you are looking for them, you will be able to find them in the humidor of many cigar shops. They are a quality cigar, too; beginning with a Nicaraguan Maduro wrapper, and then being filled with some of the best tobacco Nicaragua has to offer, tobacco that has been aged for a few extra years to make it a bit more mellow and more complex. The result is a flavorful and full-bodied cigar, one that will have you coming back for more, and one with a hint of coffee in it. Truly, one of the best cigars from La Gloria Cubana,.